On Friday 7 September Radisson Blu Plaza Hotel Sydney hosted a special gala dinner to raise funds for The Infants’ Home. Gala guests were invited to participate in a range of fundraising games and activities, including a silent auction, a wheel of fortune and raffles with fabulous prizes including hotel stay vouchers, gift baskets, holiday getaways and a $5,000 shopping spree at Robert Cliff Master Jewellers. Whilst the total is being tallied, we estimate fundraising to exceed $45,000 for our programs and services for children and families. Programs to be supported could include our community playgroups or educations scholarships. The children and educators made the most of the sunshine at Johnson House and a small group of children have been working hard on The Mindfulness Garden they are creating. 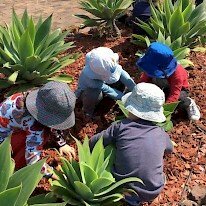 Gardening is also a wonderful opportunity for the children to connect with the natural world, develop a respect for the environment as well as have the opportunity to learn a range concepts to help create a holistic approach to learning. To follow the children’s interest in singing and playing musical instruments, the educators in Johnson House Toddlers planned a tapping stick singing experience. This time we focused on children’s understanding about spaces (e.g. up-down, left-right, back-forth) through singing the song ‘Tap Your Sticks’. The children enjoyed the integrated group on Fridays with Simone (Speech Pathologist), Amanda, (Occupational Therapist) and Sabreena (Educator). The children have had the opportunity to enhance both their social communication and play skills. Social communication skills refers to the use of language in social contexts, which includes social interaction, social thinking, how children communicate and how they interpret social messages from their peers. The children have been supported to check in at the start of the group, and then they participate in a variety of songs, movement experiences and games. This month Murray House contributed to National Child Protection Week by supporting the children in being respectful and aware of their own and others’ emotions. So this week, mat time has been focused on feelings. We’ve been reading books (‘Bear feels happy’ and ‘Bear feels sad’), singing songs (‘If you’re happy and you know it’) and engaging in activities which supported our discussions about feelings. Throughout mat time the children demonstrated an understanding of feelings by talking about what makes them happy and sad. The children in our infants’ room were interested in exploring movement and gravity. They often asked their Educators to throw balls onto the sunshade, so that they can watch the balls roll down slowly in many directions, and then cheer excitedly as they drop off the edge. Following this interest, and intentionally supporting children to use their independence, we set up a mini sail using a large piece of fabric, which we tied around the tree at the children’s height. Soon the children excitedly took turns to throw the balls on top of the fabric and watched them come rolling down. 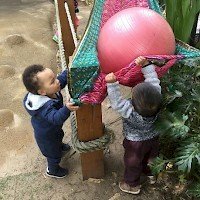 They also used their problem-solving skills to get the balls out of the fabric when they got stuck – some children cleverly stood underneath the fabric to push the stuck balls up from beneath. Gorton Infants Program had fun engaged in manipulating clay in many different ways. They all enjoyed squishing, squeezing, pulling and pushing the clay. We gave them some water as the clay started to dry and they loved the slippery feeling that the addition of the water created. It was a rich sensory experience for all of the children. Clay is fantastic for further developing the children’s fine motor skills and their hand-eye coordination. A small group of Gorton House preschoolers and Educators went for their first visit to a local aged care facility. We were greeted by very friendly staff and soon wandered out into a courtyard to meet our new friends. While some of us were initially (understandably) a little uncertain, others eagerly began chatting and drawing alongside residents. Some children showed interest in looking at the birds in an aviary, while others began making and flying paper airplanes with one of the residents, comparing the speed and length of each flight. 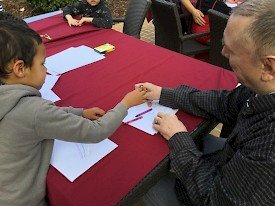 Other children connected with residents and staff over their drawing techniques and skills. 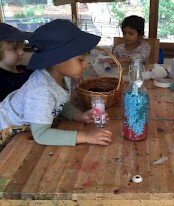 Rigby Babies and Toddlers continued to build their understanding of recycling, sustainability and caring for the environment. After having a drink of water, they pour any leftover water into our garden beds, so that the plants can also have a drink. They also help their Educators put recyclables into the correct bins. 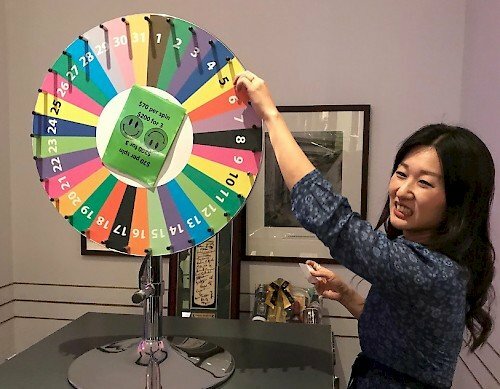 During September in Robinson House one of our educators has been passionate about sharing her bilingual skills in speaking both English and Mandarin, and she has been teaching the children as well as educators how to speak Mandarin. This intentionally planned group encourages and provides different opportunities for the children to practice Mandarin and to learn a language other than English. We have also been focusing on sustainability, and we’ve been working on a range of ways to encourage families and children to contribute to the curriculum, for example, inviting families to bring in recycled materials that we can use for creative arts and construction. To support this innovative project the educators have set up two recycling stations, one in the art studio and the other near the door in the heart. We’re setting up the recycling stations essentially to encourage the children’s creativity and broaden their understanding of how we look after the environment and re-use items. 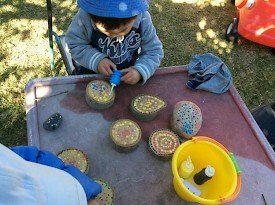 At Family Day Care Sydney Wide St George, Family Day Care Educator Chi helped the children to explore art through natural materials, offering them tree stumps and rocks to use in their art work. This learning experience provided the children at Chi’s family day care with the opportunity to explore pattern making through art. 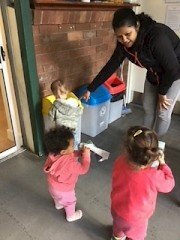 At Family Day Care Sydney Wide Inner West during play group this week the children had the opportunity to plant their own mung bean seeds on cotton wool in small cups. We discussed what plants might need to grow, and many of the children shared their current knowledge of water and sunlight. To continue investigating plants we transferred the learning into the art area, where the children engaged in real life painting of different plants.